Badoo provides you with an extensive dating site that reaches thousands of singles everywhere. You can choose to meet singles in your geographic location, or chat with someone in another country. Users find that Badoo provides the most interaction online without having to pay. The mobile site and app make it simple to reach people no matter where you’re located. Users can get Badoo’s mobile application for their Android or iOS phones. A free and paid version is available for both mobile markets. The mobile app works well on a tablet PC. Other mobile devices that do not use the Android or Apple market are encouraged to use Badoo’s mobile website. The site is tailored to fit any mobile device and works well on the screen. Free registration and free-to-use services are what most online daters seek. However, paid memberships are also available at Badoo. Premium 3-month membership starts at £24.99. 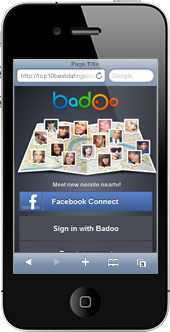 Badoo is simple to use on the mobile application and the mobile website. You can view photos, profiles, and chat from the mobile site or app. Buttons are big enough to touch, and words are easy to view on Badoo’s mobile site. Badoo.com provides a safe environment for users to chat and meet new singles. They do not allow profiles for teenagers under the age of 18. They also do not share personal information with third-party sites, nor do they provide private user information to other members.